Plump, babbling, feather-brained guinea fowl run ahead of us in silly mobs. Perched atop impossibly skinny blue necks, their noggins look professionally shrunk by headhunters. The morning air is hot, dusty, and soft as windblown sheets. A faint sizzle above my head makes me look up. A pointed dart in the shape of a cross moves steadily across the pale blue sky, spawns a cloud of ice behind itself for a hundred miles or more. Its contrail broadens from a sharp point into a wide cottony smudge. One of the astronauts reported from space that contrails could be seen over all parts of the world, often radiating from major airports like the spokes on a wheel. Morula and I mosey along at the rear of the herd, one foot in front of the other, each footstep connected to the next one. I place my boot inside Morula’s huge footprint. The brand name of my boots is imprinted within the outline of my soles; a clever advertisement made with each step. My boots make deeper impressions than Morula’s feet because each one of my steps applies more pressure per square inch. All my weight transfers to my feet, my two small points of contact with the earth. Morula’s weight spreads over four large footpads the size of a medium pizza pan. One week ago, looking down from a jet that took me across Tanzania, I was surprised to see crater after crater, giant ancient footprints, leading to Kilma-ngaro, the Maasai words for “hill of water.” At 19,340 feet, Kilimanjaro is the highest peak in Africa and one of its oldest volcanic cones, providing water to the rivers of the Masa Mara. Some of the cratered footprints leading to Kilimanjaro were shaped like the sharp tracks of zebras. Others were so worn down they were completely covered with vegetation, visible only from the air. The sequence of volcanic craters looked as if Kilimanjaro itself had marched up the eastern fault line of the Great Rift Valley, which is sort of what volcanoes do, given millions of years to do it. From the air, I could see webs of roads and trails near the ancient craters – some leading up to their rims, some circling around them. Many of these paths are generations old, harmonious with the landscape, paths that flow around obstacles and toward places of safety and browse. Compacted by many feet, they are safe passages across treacherous quagmires that could swallow you and me. Some of them make so much sense to the feet that they can be followed in the dark. In Kenya, the old highway from Nairobi to Nakuru was once an ancient elephant route, zigzagging down to the Rift Valley floor. Earlier in the afternoon, the elephants stopped to browse. I took a photograph of Morula resting against an eroded termite mound and noticed the bottoms of her feet were as cracked as dried mud puddles. They mirrored the ground upon which she walks. Morula has four toes on her front feet and three on her hind feet. They grow at a rate that might be expected from an animal that walks twenty to thirty miles a day. In captivity, an elephant’s nails must be constantly trimmed, often on a daily basis; otherwise they become infected and ingrown. 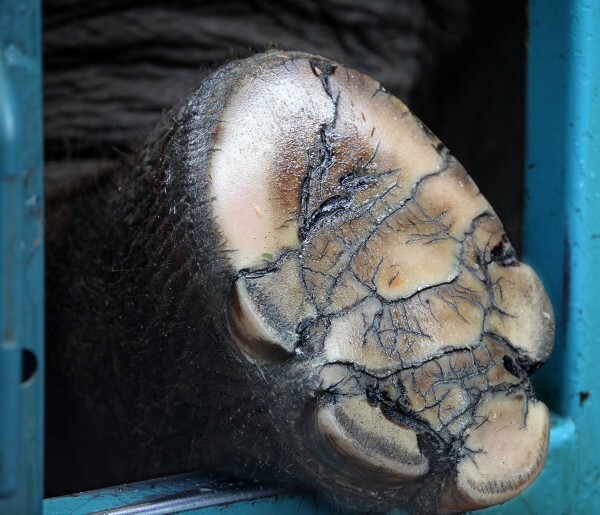 Incarcerated elephants also have problems with the pads on their feet. Without wide-ranging activity the pads thicken and grow hard and must frequently be pared down. Otherwise their feet begin to resemble shoes with worn heels. The displacement of their gait will cause joint problems later on. Tramping along in Morula’s wake, I’m beginning to get the hang of all this walking and browsing – less sweating, less reliance on my water bottle. I’m beginning to wish I could do this every day of my life. There’s a lot of languid movement packed into the word: “browse.” Days and weeks and years of walking. Walking and stopping. Walking and stopping. 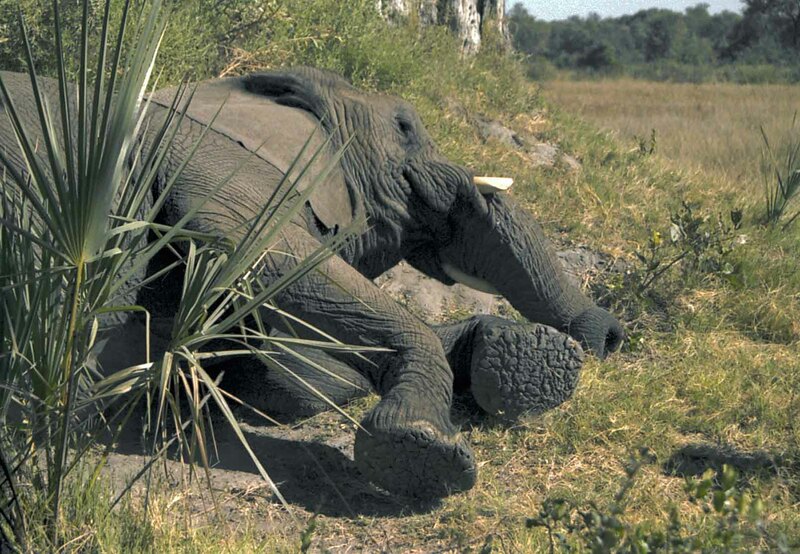 Walking in one elephant’s lifetime the equivalent of 5 times around the circumference of the earth. Morula’s round print, side-by-side with my boot print, tell a story of companionship, of human and elephant as equals. Our direction is not purposeful or hurried or even random. We take this path day after day, a normal occurrence. It’s a way of life. Imagine that. A way of life. Your writing is like candy to me – it feeds me sweetly and I love it. Oh, thank you for those kind words Jo Ann. Feedback like that is candy to a writer! If you are “following” my blog, you will get an email every time I post on the blog. You can use your WordPress settings to never get that email. Hopes this helps.